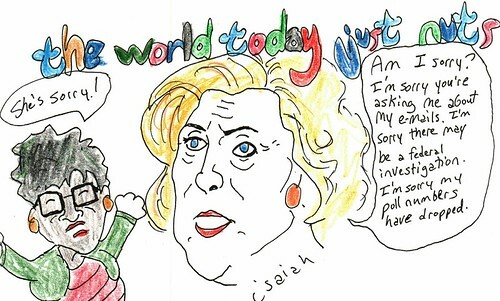 The Common Ills: Isaiah's The World Today Just Nuts "She's Sorry"
Isaiah's latest The World Today Just Nuts "She's Sorry." Cranky Clinton explains, "Am I sorry? I'm sorry you're asking me about my e-mails. I'm sorry there may be a federal investigation. I'm sorry my poll numbers have dropped." Valerie Jarrett exclaims, "She's sorry!" Isaiah archives his comics at The World Today Just Nuts.